The park features a number of facilities for visitors, including four gazebos, a sheltered picnic area, restrooms, and playground equipment for young visitors. An amphitheater is located on-site for summertime concerts or special events, and there’s also a seasonal paddleboard business that sets up shop in the warm weather months, allowing visitors to cruise across the lake with ease. Kayakers and stand-up paddle boarders are also welcome, and the calm and still waters are perfect for beginners and younger water sports enthusiasts. Visitors who’d rather lean back and enjoy the scene will also find a small walking trail that encircles the park, as well as plenty of benches stationed on the lake’s borders. With plenty of views and easy-going ways to have fun, Carolina Beach Lake Park is a cool destination that’s close to the sand, but feels miles away. Carolina Lake is a surprising attraction alongCarolina Beaches' shoreline for more reasons than one. Besides having the distinctive honor of being one of the closest freshwater lakes to a body of saltwater, (which earned the lake its former Guinness honor), the lake is a surprisingly secluded and peaceful destination, surrounded by vacation homes and ice cream shops, but nevertheless maintaining it natural charms. An ideal off-the beach waterfront destination that's just a stone's throw from the shoreline, Carolina Lake is making waves as Carolina Beaches' second most popular body of water. 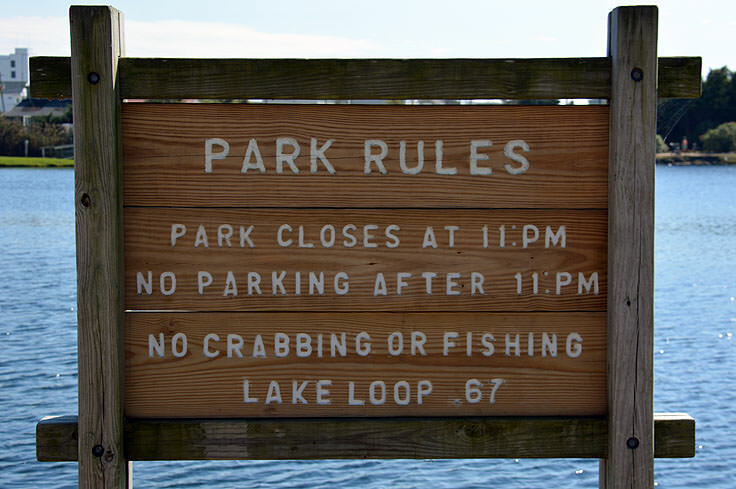 Considering that the Atlantic Ocean is located just a block or two away, Carolina Lake may seem rather small at first glance, but the 11 acre freshwater lake is actually a big attraction in these parts of Coastal Carolina, featuring a number of waterfront activities, amenities and special events. A paddleboat company provides boat rentals daily, allowing families to explore the easily navigable waters which boast 360 degree views of the town of Carolina Beach, as well as a a seasonally operated and centrally located fountain. The paddleboat and kayak rentals are conveniently located next to the park's main parking area, accessed by a side street along Carolina Beaches' Atlanta Ave., and boat are rented on an hourly basis in the $12-$22 range, depending on the type and size of the boat. Visitors don't necessarily have to get their feet wet to enjoy the water, however. 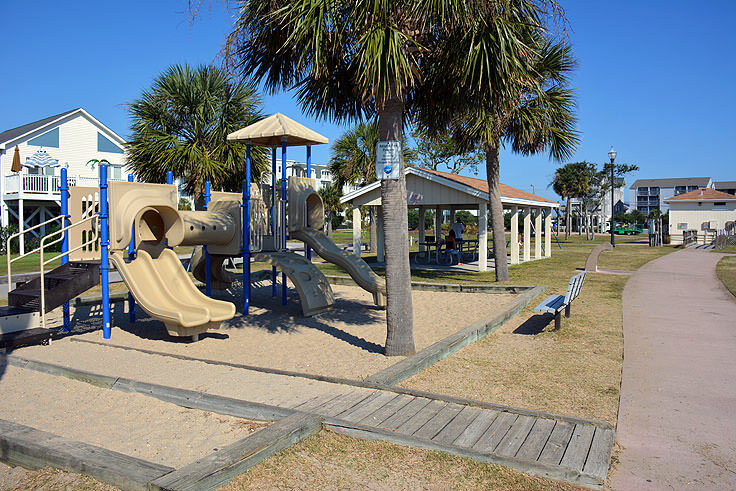 The park also features four lakefront gazebos, intermittently spaced and ideal for lazy shaded views, restrooms, a sheltered picnic area for quick lunches off the beach, and playground equipment for Carolina Beaches' youngest visitors. A hard path winds along the perimeter of the lake, (including several sections of boardwalks over the water), making Carolina Lake a fun, scenic, and easy-to-traverse destination for walkers and joggers alike. 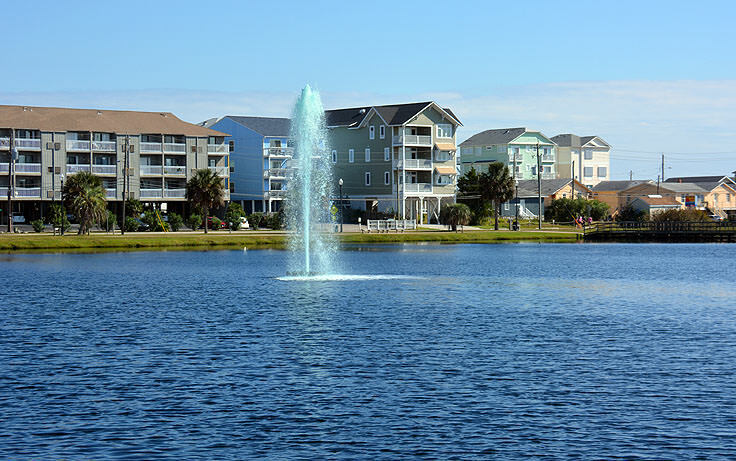 The park may be a secondary attraction to the Atlantic Ocean beaches for the majority of the year, but during a number of special events in Carolina Beach, Carolina Lake is the star of the shore. An annual "Light up the Lake" celebration is held during the holidays, illuminating the lake with thousands of Christmas lights, and the lake is also the venue for weekly outdoor films and annual fireworks displays, which are wide open to the public. While this record-holding attraction might not be Carolina Beaches' most famous body of water, Carolina Lake is nevertheless one of its most distinctive attractions. 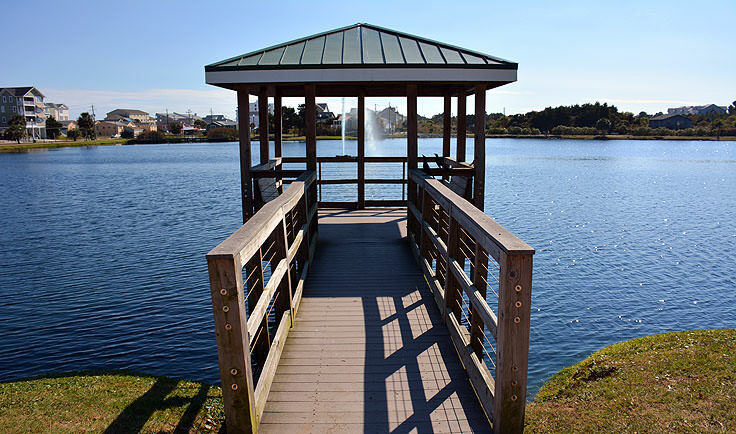 A gorgeously calm freshwater lake with a surprising location just two blocks from the oceanfront, Carolina Lake is just one of the many examples of why this Coastal Carolina destination holds plenty of charm and surprises for its dedicated visitors.